Sinful Southern Sweets: Petit Fours & Pie..Oh My!! And a CSN Giveaway!!! Petit Fours & Pie..Oh My!! And a CSN Giveaway!!! Not too long ago, I was asked to do a product review for CSN stores. I’ve said it before, CSN is a fabulous online source for most anything. Can you believe they've got everything from dining room tables to toys. I’ve done a few giveaways and reviews for them, but I seriously shop at CSN stores even when I’m not in blogging mode. I really like the selection, the prices, and how quick they are to ship their products out. I’ve not had a single issue with any of my transactions. Ok, ok, I’ll stop bragging on CSN now. On to the review, recipe and GIVEAWAY! So, with my review products, I made 2 recipes. The first, with the pink Emile Henry Pie Plate, I made a classic Apple Pie. 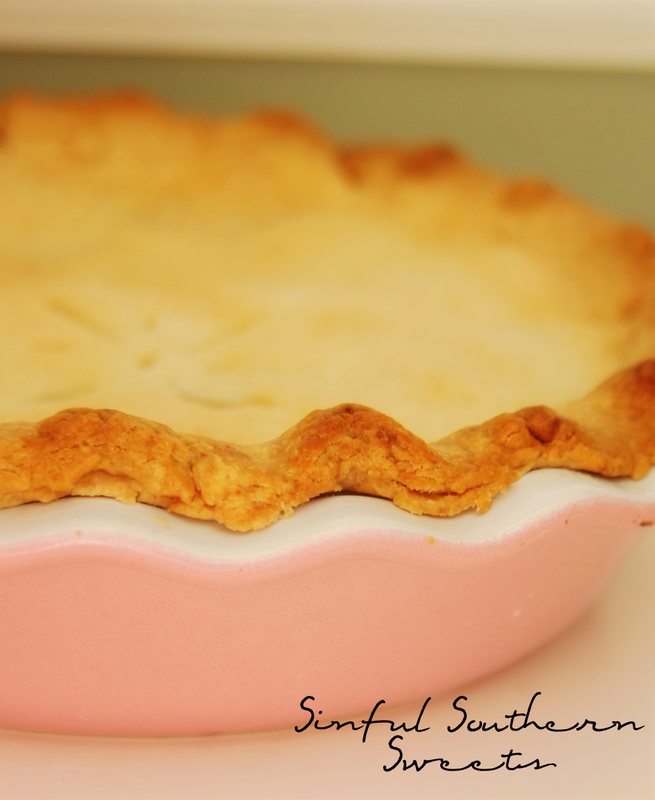 This apple pie brought back a major rush of memories due to its flavor. One of my very favorite great-aunts made fried apple pies often when I was a child. The filling on those fried pies was so extraordinarily sweet and cinnamony. This filling is very much the same. Plus, who doesn’t like apple pie!?! (Ok, if you don’t that’s ok, please don’t flood my inbox with emails stating that its ok to dislike apple pie. It was rhetorical:) On the pie plate itself, I seriously love it! I love its color, pretty pink on the outside white on the inside. Its stoneware, but its finished with a lovely shiny glaze making it naturally non-stick. So, you get the great even cooking of the stoneware, but not all the sticking issues that is sometimes associated with stoneware. 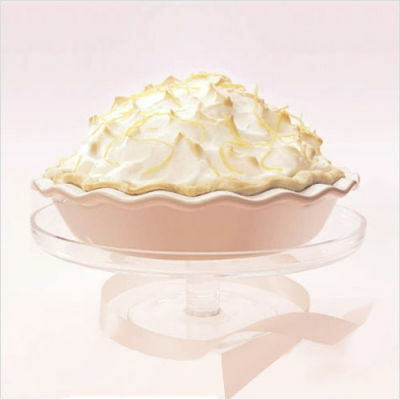 Best of all, the pink pie plate is part of the Bake for the Cure campaign which supports The Susan G. Koman for the Cure, formerly known as The Susan G. Komen Breast Cancer Foundation. Emily Henre donates 10% of the sales of the Bake for the Cure products to Susan G. Comen for the Cure. Great products for a great cause. 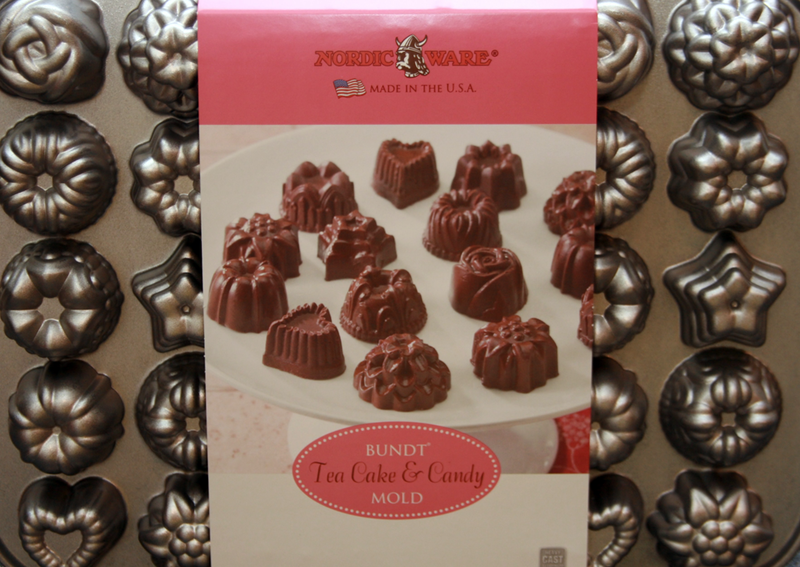 Next, I tried the Nordicware Pan to try out a few different options. 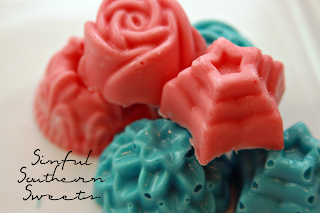 I loved the idea of making petit fours. Which, thinking back, I’m not really sure why. I really despise making petit fours. I don’t know…it just seems like a lot of work for something so small. Perhaps, it’s the idea of petit fours that I love. Yes, that must be it. Anyways, I did make Petit Fours, which turned out cute. I suppose this pan really made it easier since there was no slicing and trying to make perfect squares and layers. One annoyance that I have with Petit Fours is that the icing never seems to cover as well as I would like. I can always seem to see the actual cake under the icing. Now, I’m certain this is user error on my behalf and certainly this has nothing to do with the pan. And perhaps it is only an issue for me, because I do not recall anyone that tried the petit fours making remarks about the sight of underlying cake. That said, this recipe for petit fours is wonderful!! They do have the flavor and texture of the petit fours that you would buy in a high end bakery, but they start with a cake mix. The recipe worked great in this pan, picking up the beautiful, intricate details. The release was perfect. No sticking. 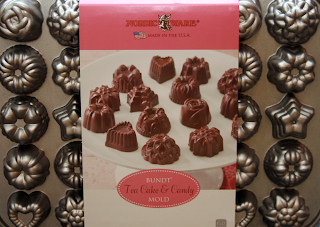 I did also try the Nordicware pan to make candies. This I thought was even better than the petit fours. I did find that pouring the chocolate/candy coating into the pans would produce tiny holes in the surface of the candies. This absolutely drives me nutty. I banged the pans repeatedly to try to produce candy with no holes, but my efforts were fruitless. So, finally I read the instructions that came with the pan. Well, apparently, those things are quite useful on occasion. The instructions indicated that I should “paint” the chocolate into the pan first. Let it set and then finish filling the molds. Well, it worked. No holey chocolates after that. Well, at least fewer and less noticeable holes. See the blue ones were poured and the pink ones were painted and then poured. I love how well the chocolates picked up the details of the pan. Very pretty. I did find, for some reason, if I greased the pan, the candy seemed to stick. Go figure… it’s a non stick pan to start with so I don’t know if that had something to do with it. But that’s how it worked out for me. I think these cute candies would be perfect for a bridal/baby shower, ladies luncheon, or a tea party with some sweet little princesses! Recipes will follow the giveaway info. Enjoy! And here’s the part you‘ve all been waiting for!! CSN has offered to giveaway a $65 gift certificate to one of my Sinful Southern Sweets readers. So, you can get some great cooking gadgets, homewares, toys for the kids (Christmas will be here before you know it! ), or anything your hear desires from one of their 200+ stores. Leave a separate comment below on each of the things that you do for your entries. * Visit the CSN website and comment below on a product you might like to have in your own home. 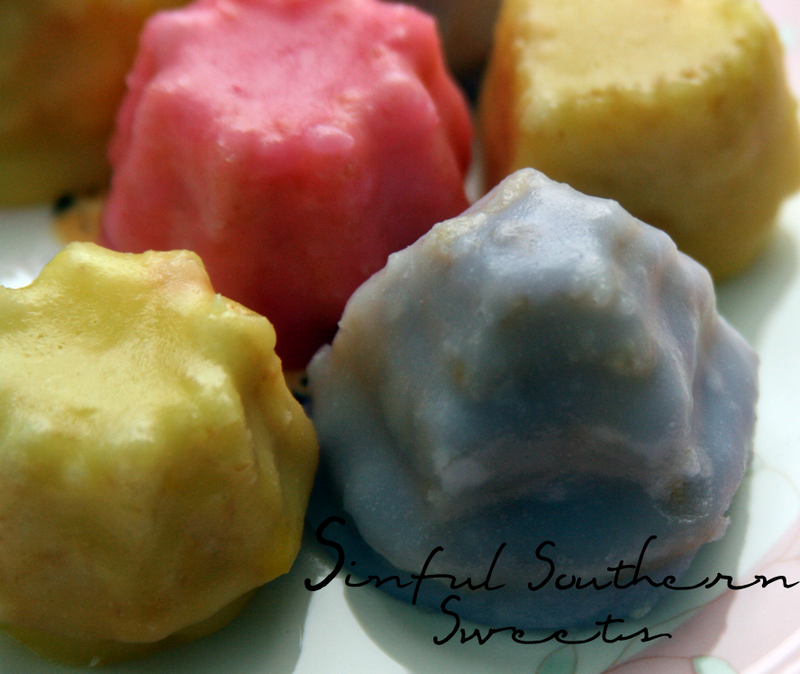 *Become a Sinful Southern Sweets follower via Google Friend Connect. If you are already a follower just comment that you are. *Tweet this giveaway with a link back to this post. 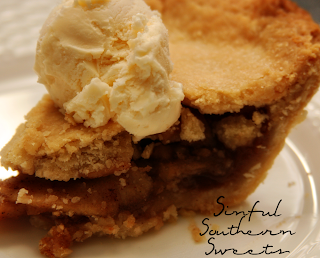 *Leave a comment telling me a recipe you'd like to see me blog on Sinful Southern Sweets. Deadline: Midnight Eastern Time on September 25th . Contest open to all US and Canadian friends) residents only. You do not need a blog to enter. Good Luck!! Preheat oven to 425 degrees F. Place one crust into a 9-inch pie pan. Place sliced apples into a large mixing bowl and set aside. Combine sugars, cornstarch, cinnamon, nutmeg and salt in a small bowl. Sprinkle mixture over apples and toss. Spoon apple mixture into piecrust. Place the second crust over the filling. Seal edges, trim and flute. Make small openings in the top crust. Bake in preheated 425 degrees F oven 40-50 minutes or until the top crust is golden. Serve warm or chilled. Heat oven to 350°F. Grease and flour 2 (8-inch) square baking pans. Set aside. Prepare cake mix according to package directions, adding 1/2 teaspoon almond extract with water. Evenly divide cake batter between prepared pans. Bake for 20 to 30 minutes or until toothpick inserted in center comes out clean. Cool 10 minutes; remove from pans. Cool completely. Trim edges from cake; cut each cake into 24 (1 1/2 x 1-inch) pieces. Combine sugar, cream of tartar and water in 3-quart saucepan. Cook over medium heat, stirring occasionally, until mixture comes to a full boil (12 to 14 minutes). Cover; boil 3 minutes. Uncover; continue cooking until candy thermometer reaches (228°F. to 234°F.) or small amount of mixture dropped into ice water forms a 2-inch soft thread (15 to 20 minutes). Remove from heat; cool to 110°F. or until bottom of pan is slightly warm to touch (do not stir) (1 hour). Stir in powdered sugar, 1 teaspoon almond extract and food color. I would like to stock up on toilet paper,that would really be enough toilet paper to last me such a long time.Yay!!! I am a new follower of your blog,hello! I love the Kokoware Xen vase! I would love the Howard Miller Cyrus Quartz Wall Clock to be in my house. I need a wall clock . I don't have a dining room so would like the Nantucket 3 Piece Breakfast Set...when not being used for dining, it would make an excellant work area. I now follow CSN on Twitter. I would love any of the Le Creuset cookware. I would love to see anything for Christmas treats to give to neighbors. It's not too far away! I like the bassett mirror silver antique beaded leaner mirror. I think I would love the kids silicone bakign set! All your recipe/posts are already so amazing. I'm not sure what I would like to see you post.... maybe some great (and fun) Halloween treat! follow you through google friend connect. WOW what is a fried apple pie! Apple pie is great and anything fried must be delicious! I would love to get a new blender! Your pie looks awesome. Love the new pie pan! I follow your blog through my Google reader! Now that autumn is upon us, how about a Pumpkin Pie recipe. I am really wanting a new kitchen aid mixer! anything with pumpkin is what I would like to see! And also don't forget, for more easy HTML tutorials, or help increasing your blog's traffic, you know where to come! Plus today we teach another one of our blog tutorials, so make sure you don't miss it! Happy Tuesday! Tag Along! Would love for you to check out my blog and do the same! I'd love to spruce up my dishes! CSN's website has so many pretty plates that would look great in photos. Hi! I'm following you on GFC! I found you on Tuesday Tagalong...feel free to follow back! Thanks! They have a Brother Sewing machine that would be perfect for a beginner like me. I would likeot have it. I'd get the Texture Home Decor Inlaid Stonecast One Scared Cat Figurine for a Christmas gift! I would like to have the Emerilware cast iron dutch oven.